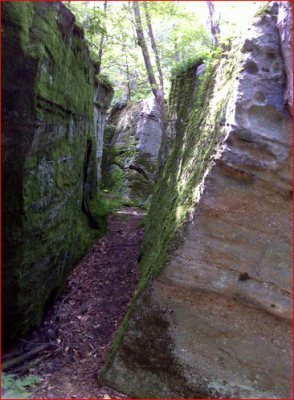 Thanks to Dave Potzler, Foothills Trail Chair, there is a newly marked trail that explores the amazing maze of huge rocks in Little Rock City (Finger Lakes Trail map M3/CT3) south of Ellicottville. This new trail is marked with circular yellow DEC discs and is 0.7 mile long. 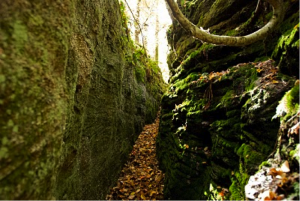 Enjoy the beauty of narrow crevices between the rocks, hanging fern gardens, and exposed tree roots that can be a dozen feet long. 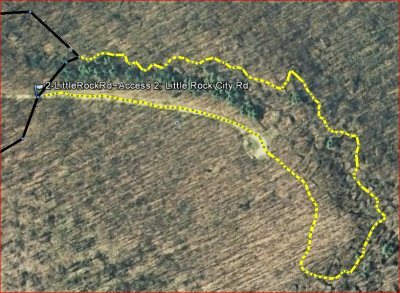 From Access 2 (where the main trail crosses Little Rock City Road) go east on the road 0.2 mile to the turn-around loop to pick up the yellow discs. Follow them 0.5 mile to explore the wonders of Little Rock City. Dave will try to get the DEC to approve making this trail part of the main trail so future hikers will not miss it. In fact, it used to be part of the main trail, but for some reason it was moved. I remember following what was essentially this yellow trail back in the ’80s hiking with friend Ed Hart. I couldn’t believe such a rock city existed in NY state! This new trail has been added to an updated map M4/CT4.